The UConn Quest Portal is used by offices at the University of Connecticut to collect applications and administer review processes. It is powered by SurveyMonkey Apply and jointly administered by the Office of the Vice President for Research and the Office of Undergraduate Research. While using the site, you can access help documentation by clicking on the "i" icon in the top right corner. This page serves as an additional resource to address common user questions related to OUR applications: Requesting a Recommendation, Modifying a Complete Task, and Submitting an Application. Recommendation tasks in the system are designated by the thumbs up icon. Click on the task to begin. The task and its instructions will display as in the image below. Click on the green "Request a Recommendation" button to enter your recommender's name and email address. You may also elect to write a message to your recommender, which will be included in the recommendation request they receive via email. Click on the green "Send Request" button. 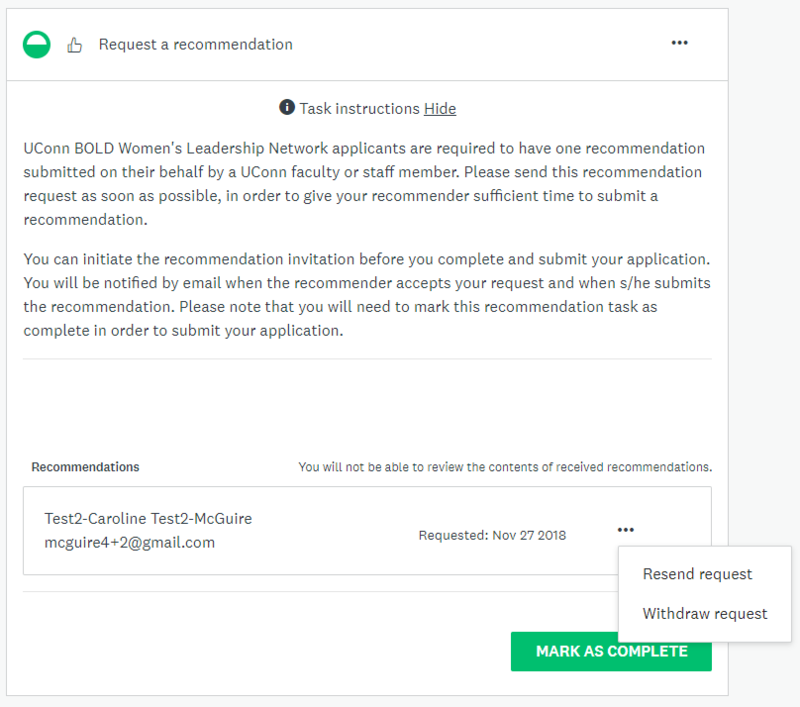 Once you have sent the request to your recommender, the task status will change to a half-full green circle to show that it is in progress, and you'll see your recommender's information and the date of the request, as in the image below. 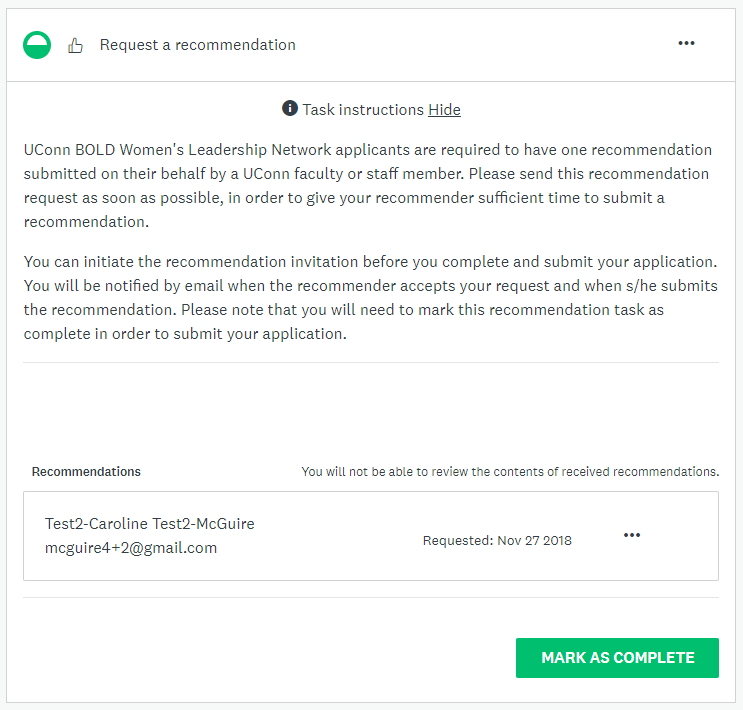 If you need to resend the recommendation request, or withdraw it so that a different person can act as a recommender instead, click on the three dots to the right of the recommender details. This will allow you to either resend the request or withdraw the request. In order to submit your application, all application tasks must be complete. This means that you must mark your recommendation task as complete by clicking the "Mark as Complete" button, even if the recommendation has not yet been submitted. 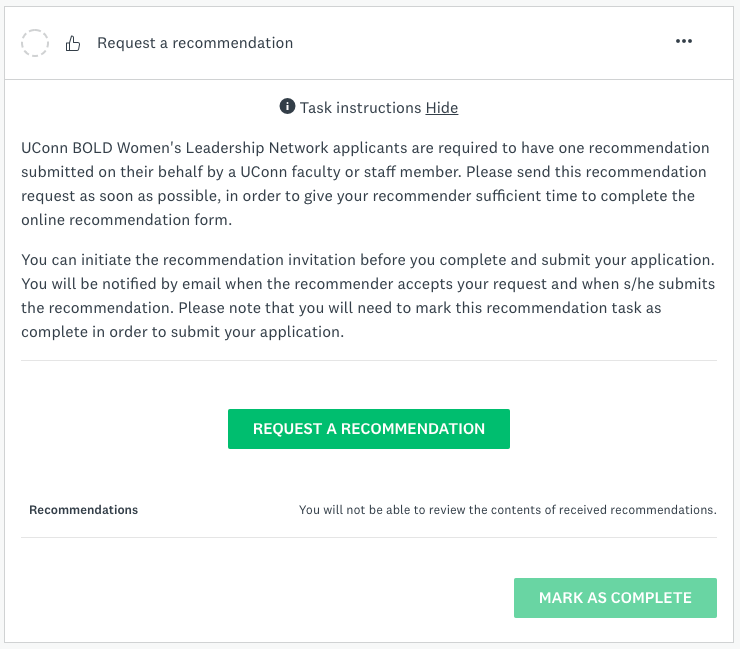 Rest assured that your recommender will still be able to submit their recommendation - marking the task as complete does not affect their ability to submit a recommendation. A green circle with a checkmark will appear next to complete tasks. However, you can still make modifications to such tasks. Open the task and click on the three dots to the right of the task name to display the following options: Download, Reset, and Edit. Reset will remove all task content. Edit, on the other hand, will allow you to make changes to the existing task content. In order to submit an application, all the tasks within the application must be complete. When all tasks are complete, as in the image below on the right, the "Review & Submit" button will turn green and become clickable. Once you click the "Review & Submit" button, you will be able to review and download your application materials. You can scroll through all your submitted materials on this screen. Alternatively, you can download your application for review and/or for your records using the download link in the top right corner. You must click the "Submit Your Application" button to complete and submit your application.